All cyclists hate the wait at Evans Street junction. Let's just get that said and out of the way. cyclists through it in the State. We rock up at this light and we seem to wait and wait ... and we get frustrated and the temptation to run the red light builds and builds (I mean surely it's been red now for at least 4 minutes???) but so to does the risk of crossing and AAARGGGHHH ... why can't they just do something about it!!!! We sit there frustrated (as all those other cyclists and pedestrians run the red light), but we wait (and get more frustrated), and go on green building up our brownie points in cycling heaven. A small, but increasing, number of cyclists are cycling out into Davey Street (at least on the way into work in the morning) just above the Engineers Building (at the little lay out) and then just ride through the intersection with the flow of traffic, rejoining the bike lane on the other side (the straight red line on the map below). This is an interesting one, because practically it gives them a 1 minute 40 second window to get through the intersection, rather than 15 seconds, but it is arguably still illegal under road rule 260 which seems (with my bush lawyer hat on) to indicate that a rider on a bicycle must still comply with the cycling lights at the intersection, not the main lights, no matter where they are in the intersection, so technically my reading of the road rules is that if the cycling light is red, the cyclist has to stop, which doesn't really make sense if you're in the main flow of traffic and the main light is red - I'd love to have that clarified though). which follows the hooked yellow line. On the way out of town in the evening, the options for getting across this intersection are a little more constrained, and I'd guess that we mostly either wait for the green light, or run the red light, as the Evan Street options are less attractive heading out of town (why do a long detour when there's a chance you might hit a green light?). The on-street option doesn't exist as Davey Street is one way. So, hopefully that pretty much summarises how we cyclists feel about the Evans Street intersection, and what we all sort of do. There is of course another side to all of this. Despite our frustration at that red cycling light, most of us know that in peak hour traffic, the magical beings that try and keep the traffic flowing are probably far more focused on getting the thousands of vehicles that flow through that intersection moving than they are about a few cyclists having a bit of a delay (I couldn't find an actual number on vehicles, but I did find a report that said that 37,200 vehicles in total went up Davey Street each day in 2011). We're just rebalancing a bad decision - right! Maybe an enlightened being like Spock might approve, but of course the police, motorists and the general community won't. But really all of the above is a bit of conjecture because we each only really get a small glimpse into the traffic flow each day (and we're usually pretty frustrated when we do waiting for that light to go green). Well, we (James and I) decided on Wednesday 23 March to take a peek (no pun intended) into the mystical world of what is happening at Evans Street so that we could talk numbers not just discuss viewpoints. So we sat there (latte's and good old fashioned clipboards in hand) and we counted some key bicycle and car movements through the intersection from 7:30 am to 8.45am - which we figured would catch most of the 'peak' flow of commuter traffic. We figured there were some key things we'd need to know to advance the discussion on light timing for this intersection. Firstly we were bicycling orientated so we wanted to get a handle on what cyclists were actually doing at the intersection. James also thought it would be a good idea to count Pedestrians as a bit of a comparison, so we did that as well. We also recognised that for the road planners their key consideration for managing peak flow traffic would be to get a smooth flow of vehicular traffic into and out of the city and in particular they would want a light sequence that doesn't result in traffic turning into Evans street choking up the greater flow of traffic into the city, so we counted the number of vehicles turning into Evans street from Davey Street, and we actually tried to do this in 15 second blocks to get a picture of the 'flow' of traffic. Firstly, the basics - on the morning we counted, the traffic light at Evans Street and Davey Street was red for traffic coming into the city for 20 seconds and then green for 100 seconds (1 min 40 seconds). So it was a two minute cycle. Cyclists and pedestrians only had a green light for 15 seconds of that two minute cycle and only if someone had pressed the pedestrian of cyclist button (See this link to read about Bicycle Networks successful campaign run last year to extend the green pedestrian/cycling light time from 5 seconds to 15 seconds). We did, however, note that if either the cycling or pedestrian button was pressed then the traffic turning left into Evans street was held up by a red arrow for those fifteen seconds to ensure that any cyclists entering the junction during a green light did not get hit - kudos to the road planners for that idea. 132 cyclists and 56 pedestrians (total 188) crossing through the intersection on the bike path side of Davey Street. 116 cyclists (88%) and 49 pedestrians (88%) were heading into the city and 12% were heading out of the city. Of the 16 cyclists heading out of town, eight cycled across on the red light, five waited for the green and three arrived on the green. Contrary to the stereotype, not every cyclist was a lycra clad MAMIL on a $5000+ road bike, in fact we saw a huge variety of bikes and people. So out of that it can be said that during the time we monitored 13% of cyclists hit the lights on green, and then of those cyclists that came to a red light, 36% waited for the light to turn green and nearly two-thirds, 64%, took some form of action to avoid waiting at the red light including 30% running the red light (almost as many that waited). 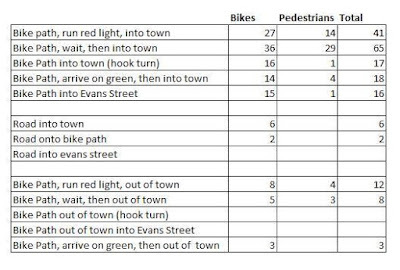 An interesting comparative statistic is that while 23% of cyclists heading into town ran the red light, this was less than the 29% of pedestrians who also walked across on the red light. And what about vehicle traffic. By way of comparison 186 vehicles turned left into Evans Street from Davey Street during the 75 minutes, which is actually slightly less than the number of pedestrians and cyclists that crossed during the same time (188). Although this wasn't something we thought to count (because we were unaware of the red arrow), we did see three cars illegally turning left on the red arrow. We did plan on counting how full the turn left lane got at each light change (it could take an estimated 8 vehicles) but what we didn't think to record was the number of times that the second lane on the left got so full that vehicles could no longer get into the turn left lane (I did see this happen a few times). I would record this next time, though in theory these cars should have come through in the first 0 to 30 seconds. None, zilch, zero ever had a full turning lane, in fact the most cars that were ever in a lane when the light turned green was four (this occurred at six light changes (15% of the time). However, if there were pedestrians and cyclists crossing the road, the cars turning left were held for another 15 seconds by a red light, so we counted the longest the line got including this extra hold time, and the most it got up to was 5 cars (once). Even allowing for a forty five second green light, this would still only have seen the lane at capacity (8 vehicles) once in the period we counted. Well, to be honest, not a huge amount without conducting the survey quite a few more times and doing it in both the morning and the afternoon because peak flow is more important than averge flow in this case (you only need one incident to hold up traffic and create gridlock), but it does (prima facie) support some of the arguments being put forward around a longer green light time for pedestrians and cyclists at the junction and it certainly does not provide evidence that the current light cycle for pedestrians/cyclists is causing any traffic issues for vehicles. There is obviously a lot of behaviour modification (including illegal running of red lights) occurring by cyclists and pedestrians who are responding to the long red light interval. Over half the cyclists we monitored (56%) modified their cycling pattern in some way from the optimum path, or they just ran the red light all of which increases the risk of injury at the intersection. This is even taking into account the 13% that just cycled across on the green light and may have also modified their behaviour if presented with a red light. You also have to remember that people were still doing this despite at least three police crack downs on this intersection (that I know of) in recent times, and the fact that there were two people sitting at the intersection with cameras and clipboards which may have induced 'better' behaviour. The vehicle count we did also seems to indicate that there isn't a high vehicular pressure of turning cyclists from Davey Street into Evans Street which would lead to a peak hour block, although I'll be the first to say that I'd want more data to support this in the current debate over managing peak hour traffic. It was also interesting to see that there was actually about the same number of cyclists and pedestrians going through that intersection as there were vehicles turning into Evans Street. 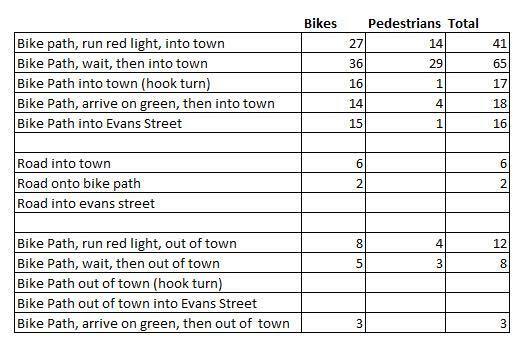 Firstly it would be great to see if this sort of data (if we collected more) might actually influence the decision makers and allow them to make an informed decision on how long the pedestrian and cycling light should remain green based on an evidence based risk analysis. Sure one response to this situation would be for more police enforcement of people on foot and on bike running red lights. Just so it's on record I don't advocate breaking the law and I don't run the red light (anymore). I cycle into work via Evans street (or very occasionally by doing a hook turn if I'm in a rush) and I wait for the red light when cycling home. But police crack downs have been done three times and it's not having a big affect because the driver (ie. long delays) for running the red light is very strong. So what are some other solutions that might lead to better outcomes? We could of course look at doing a few more counts and if the numbers look good, extend the green pedestrian/cycling light from 15 seconds to 30 seconds. This could be a potential easy win. I have seen examples in other countries where the pedestrian light turns green for a period, goes red to let the cars through and then turns green again for cyclists and pedestrians to allow a second wave to go through. Yes, you need to make sure that you control traffic turning left safely (but you can do this with the red turning left arrow signal for vehicles). Wouldn't two chances to legally cross the road be awesome? (eg. an initial 15 seconds of pedestrian/cycling green, then if a person (on bike or foot) presses the signal button after the pedestrian/cyclists light has turned red (and say a minimum 30 seconds has been provided to let cars through), then the turn left arrow could be brought back up and the pedestrian/cyclist light could go green again for another fifteen seconds letting a second flow through). How implementable this would be would depend on how programmable the current traffic lights are, but if the technology can allow us to do it, then it's just a matter of public will and education. You could also supplement this in various ways, eg. automatic bike and people sensors on the cycleway to detect them coming and having this trigger the light, painting an obvious green strip on the road as a visual cue that this is a significant cycling lane and maybe adding a "caution cyclists when turning sign" for traffic (in an ideal world, this could also be an electronic smart sign which is triggered by a cyclist going over a sensor). Another idea, growing off what is already happening (option 3), is to investigate formalising the idea of cyclists entering the traffic flow on Davey Street further up the road to improve flow (for cyclists who choose to do this) into the city (even if they could just enter the turn left lane and then move to the right of it and flow through the traffic). This wouldn't help flow coming out of the city. An old school hard-infrastructure solution, might be to adapt some of the ideas being used at roundabouts and divert cyclists 50 metres down Evans Street on the sidewalk and then have a signed and obvious cycling crossing there. This area currently has very little traffic and would essentially be formalising and making more obvious the increasing use of the u turn currently being undertaken. Another idea, which I've not seen done anywhere else, is to introduce the concept of a "flashing amber cycling light" (cyclists proceed with caution). I admit this is blue sky thinking and would need legislative change, but with improvements in vehicle detection and smart signage I could see this working. For example as you're cycling out of town you can clearly see whether or not there are any vehicles in the turn left lane and make a judgement as to whether it is safe(ish) to cross. What you don't know is how long it will be until the lights will change and whether you're going to enter the intersection just as the traffic flow changes from Davey Street to Evans Street. If there were a flashing amber cycling light that ran from the 15 second point to the 1 minute 25 second point (15 seconds before the lights change) and a countdown clock showing the time until the next light change ... then this would be enough information to let me know I could safely cross, and of course, the flashing amber light could turn to red when there is only 15 seconds until the lights change - so the countdown clock is only really a 'nice to have'. Little did I know as I set off this morning, to do just this, that not only was I heading towards an epic fail, I was also this close (think of something really close and insert it here) to the ignominy of almost drowning in what was supposed to be an empty lake. No one's surprised there, I bet. One of the first routes I put up on tassietrails.org was an out and back route from Butlers Gorge to Derwent Bridge alongside Lake King William. I later got some feedback about a potential low water route which made the ride even more attractive, but had never got back to try it. Notice Harback Road - it actually continues all the way down to a hut on Guelph Narrows. Albeit you need to walk/ride down the last few hundred metres of road. This meant that if, and it was a big if, I could get from Butlers Gorge to the other side of Guelph Narrows, then I could circumnavigate the lake. This seemed like a very rambler type thing to attempt, which is why I found myself looking out over the dam at around 11am this morning, thinking to myself "now how am I going to get across here ..."
This is actually taken from the other side, but the principle is the same. So, I had to settle for the less convenient Plan B - paddle across. Which is where it all started to go wrong. I got all my gear together (this was the big try out for the Surly ECR), rode down to the waters edge and inflated the packraft. But then, as I finished putting a last few breaths in the raft I heard that ominous sound of escaping air. After a bit of an investigation I found the culprit - the o ring seal around the main valve had several cuts in it which was letting air escape. Not a problem I thought, this is why I bought an Alpaka repair kit, so I casually opened my emergency repair kit ... and of course there was everything in there but a new o ring. After a bit more tinkering, I finally managed to get the raft inflated and it didn't sound like it was releasing air ... but I knew that that could change at any second, so after a bit more pondering and with images in my head of my new Surly ECR sinking to the bottom of the dam as my raft sank, I made the hard decision to abandon the bike and just paddle to the other side ... for a bit of a look. After all, I had driven two hours to get here and it seemed a bit of a shame to go home straight away. Figuring I was alone and that I would never be out of sight, I just left the Surly where it was and jumped in the raft to paddle to the other side. About 40 metres from shore I noticed that the raft was definitely feeling a bit softer than when I launched. About 100 metres from shore, I realised the raft was definitely soft. I started paddling a bit faster. About halfway across the raft had a horrible bend in the middle where I was sitting which indicated that it seemed to be deflating faster than I was paddling. I really started paddling at top speed with just a little bit of panic setting in. Twenty metres from shore, water was just below the top of the raft and I was starting to feel like I was in one of those cartons where the raft shrinks around you as it deflates and you go slower and slower and slower as it loses all of its firmness. But I made it, managing to touch shore and get out before the water came in over the side. I was pleased about this, as the idea of Newspaper headlines reading "Man drowns in empty lake" was not how I saw myself exiting this world. So I did what I think any reasonable person would do in this situation ... I figured I'd cross that bridge when I came to it, and wandered off to explore the area. But then, when I got there, I found this excellent track heading up the hill (the one I'd hoped to cycle to the narrows) so I thought "what harm would there be in just following that for a few hundred metres?" And soon found myself at the top of a steep little climb next to some sort of communication tower. Now despite the non-fun experience of walking in cycling shoes, it was a beautiful day and it really was a lovely area ... and hey, what were the chances of anyone stealing my stuff? ... so I thought ... "maybe I'll just wander down that side track I saw - the one that I think I saw on Google Earth that seems to head about half way to the narrows then disappears" (OK, so I didn't exactly think all of that, but just thought I'd put that in there in case anyone is reading this after seeing the same trail on google earth and is wondering if that's the one I followed). And found myself heading down a beautiful old track imagining myself on the Surly enjoying what might have been a very rare circumnavigation of the lake. Problem was ... the track seemed to continue on, and well, I'd come this far and it would be a lot of effort to come back here again ... so off I went to see where the track would take me. But I persisted for another 30 minutes or so and while there were bad patches, in the main, it was walkable, even in the gear I was wearing. It would not however have been fun on a bike, possible, but not fun. It took me over 30 minutes to walk the next kilometre and realising that I was still probably at least an hour or so away from getting to the narrows at this pace (albeit that I didn't really know as I had no maps, no phone service, and I couldn't really locate where I was in the bush) I decided to turn back. I had also gone a little bit further than I'd planned and it was playing on my mind a bit that I did just leave my bike lying in plain view on one side of the lake and my packraft on the other side of the lake just sitting there waiting for someone to drive past and think "hey, I'll take those". ... albeit that there were moments as I was jumping off logs onto muddy sections that there was this little voice in my head saying "these could be really deep" ... but they weren't and so it was just cool. I seemed to get back to the dam in no time at all, and as you do, after scrub bashing my way up from my packraft to the dam, I now found the path that ran all the way down to my raft, making my return much, much easier. Now here's the strange thing. As my facebook image says ... "I'm not a stupid person .... I just do stupid things". About half way across, I realised that my raft hadn't magically healed itself and it was, again, leaking air, but the leak was a lot slower this time and I easily made it across with around 80% of the air still in the raft. The physics of all that I still haven't figured out. All up I was out there for just under three hours, and it was a great day.